80 infants aged <5 months with colic and exclusively or predominantly (>50%) breastfed were randomly assigned to receive Lactobacillus reuteri DSM 17938 (Lactobacillus reuteri Protectis, 10^8 CFU) or placebo, once daily for 21 days. The primary outcome measures were the treatment success, defined as the percentage of children achieving a reduction in the daily average crying time ≥50%, and the duration of crying (minutes per day) at 7, 14, 21, and 28 days after randomization. In addition to this, the parents’ perception of the baby’s colic and the quality of life of the parents and the family were measured. The rate of responders to treatment was significantly higher in the probiotic group compared with the placebo group at day 7 (p= 0.026), at day 14 (p<0.001), 21 (p<0.001) and 28 (p<0.001). 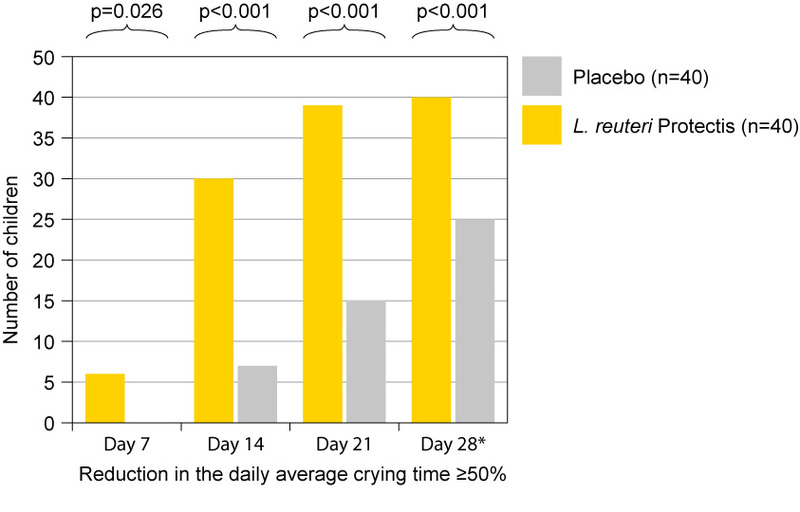 Additionally, throughout the study period, the median crying time was significantly reduced in the probiotic group compared with the control group. Moreover, in terms of the parents’ perception of the baby’s colic and quality of life, the study showed highly significant improvements in the probiotic group as compared to the placebo group. 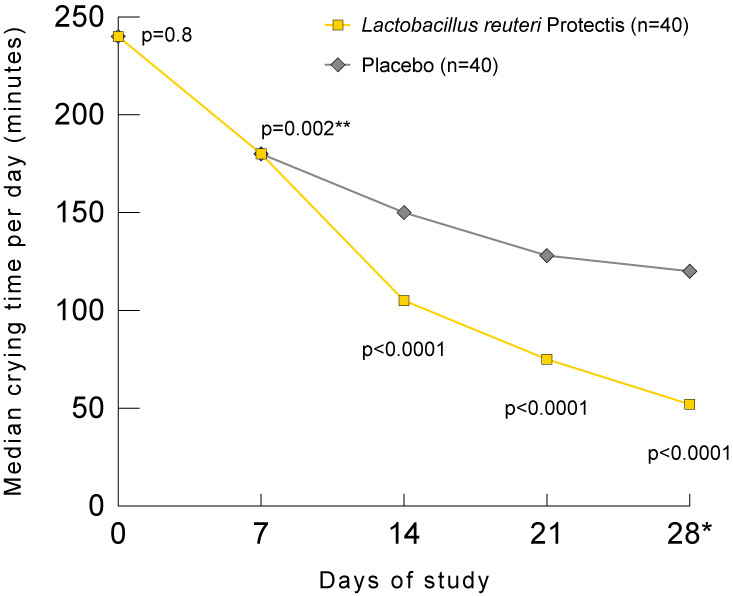 Exclusively or predominantly breastfed infants with colic benefit from the administration of Lactobacillus reuteri Protectis compared with placebo. Szajewska H, Gyrczuk E, Horvath A. Lactobacillus reuteri DSM 17938 for the management of infantile colic in breastfed infants: A randomized, double-blind, placebo-controlled trial. J Pediatr. 2013;162:257-262.